With all of us plus size gals using the power of our dollars and showing that you can have a successful plus size business, another brand has thrown their hat into to ring. Canadian Online Darling Joe Fresh has stepped into the plus size market with extended sizing. Starting now, you can order sizes 1X-3X on JoeFresh.com. Another cool thing about the extended sizing is that the price is the same as straight size. That's right!! No, $5-$10 added to the cost. For those that are not familiar with Joe Fresh they are good for updated classics. Their first collection for plus is a navy and green based collection with cami's, tee's, dresses, pants, flowy tops, and a moto jacket. It's definitely items you can wear to work and the weekend. Here are some of the pieces that are now up on the site. Currently there are 32 pieces including dresses, tops, pants and even jeans. So lovers, what do you think? I'm feeling the cold shoulder dress with the moto. I would pair it with some booties and the cute fedora they have. Let's hope they extend their offerings and have a greater assortment. I have always been a fan of their sweaters, so a cool selection of sweaters in plus would be awesome!! While walking around my local Macy's I stumbled upon a new addition to the plus size floor. To my surprise Tommy Hilfiger is back for the Spring and there are some pieces that I am definitely loving. I'm going to share some of my favorites. First up are tops. I have been stepping up my top game as of late. Though tee's are bae, I am loving all the silhouettes that have been coming out as of late. A good button up should be in every woman's wardrobe, but this off the shoulder one is hella cute. I love how it has cuffed sleeves and stripes. It also comes in white, if you are not a fan of stripes. I will admit when fringe was listed as one of the top trends a while back, I was not completely sold on it. I felt it was very boho which is not something one can say when they think of my style. 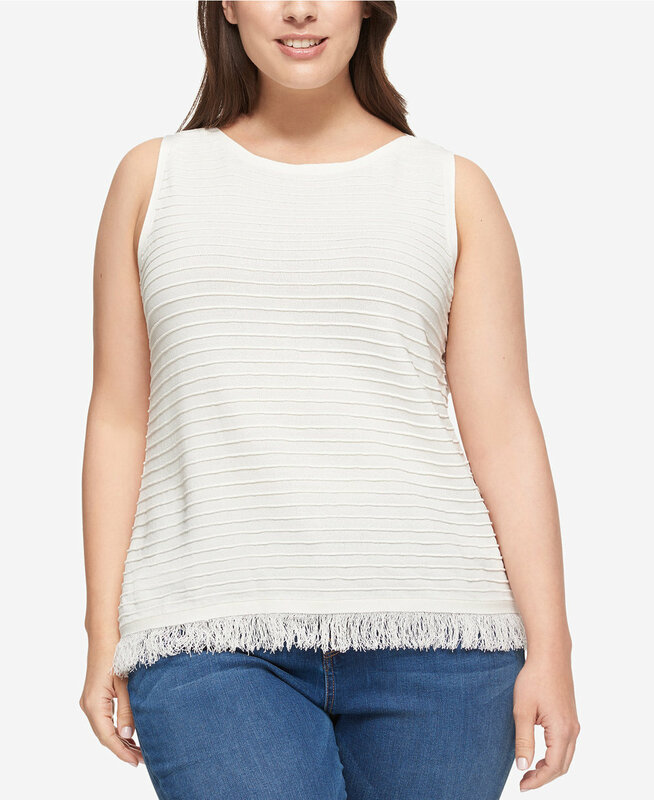 Even though super long fringe may not be my thing, I do like this fringe tank from the collection. I would wear to work with a cute pair of printed pants, or on the weekends with jeans. It's an easy cuter version of the classic tank. Now to my Spring go to - dresses. As the temps increase, I want to spend more time outside, and less time planning a look. A dress makes that happen. My two favorites are the striped tee shirt dress and the polka dot fit & flare dress. The striped dress is made of medium weight sweater material so it skims the curves. This dress is currently in my cart, so once she is here, I will definitely do a post on the fit. 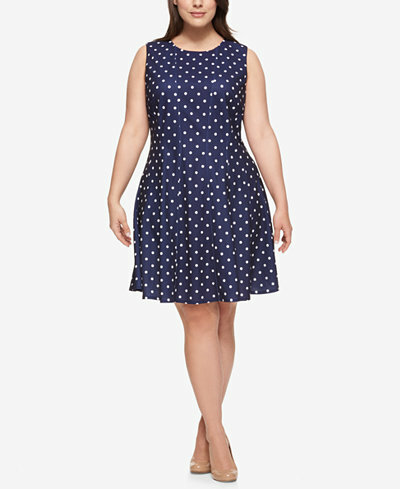 What can I say about the polka dot dress- it's a polka dot fit & flare. The silhouette can do no wrong in a print that is timeless. I would wear this with a striped belt and flats. In addition to the tops, and dresses, there are jeans, pants, and cardigans. For all my preppy classic lovers, there is definitely something out there for you. Online has about 22 pieces, but there was definitely more in my local store. Prices start at $24.50, and go up to $129.50. Don't forget that with Macy's you can always sign up for the latest deals to save even more. There you have it, Tommy Plus at Macy's and Macys.com. Let me know what you think and happy shopping!!! Good afternoon lovers! 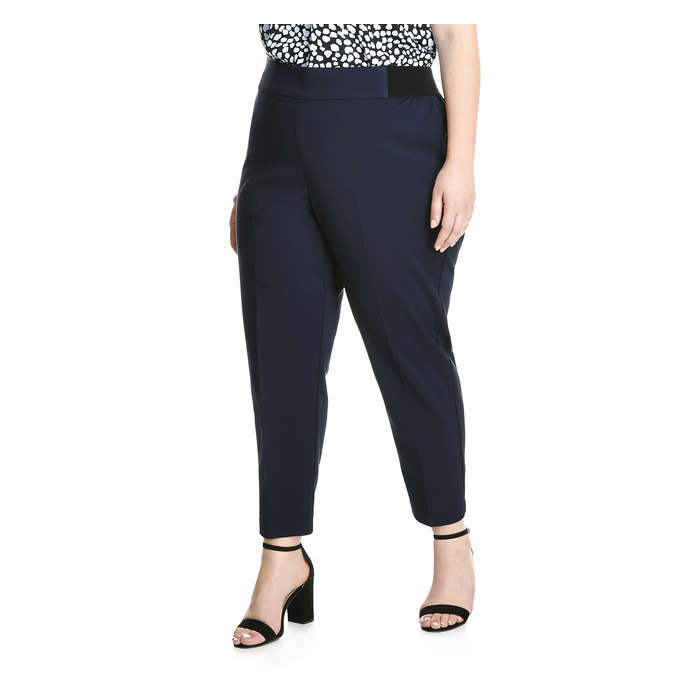 Wanted to let you know that the UK site Dorothy Perkins has launched their plus size line DP Curve! Currently on the site there are 64 pieces ranging in sizes 14-24. There are tops, dresses, and skirts to satisfy a wide variety of tastes. Best of all, nothing on the site is over $70 (which is great for my wallet)! Sign up on their site and you can receive free shipping on your first order. 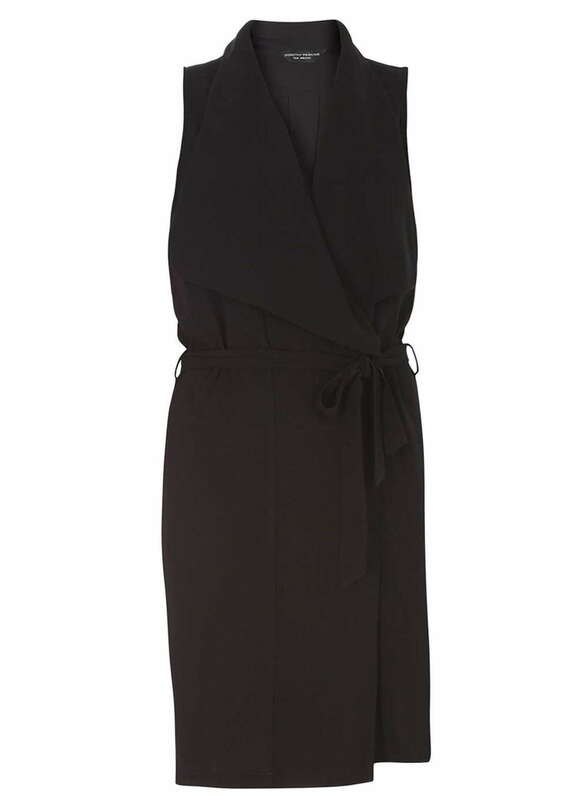 Not a bad start Dorothy Perkins, can't wait to see what else in store! Here are some of my favorites. Happy shopping! As many of you know, I am an Eloquii addict. The company has had their hooks in me since their re-launch. Their lookbooks featuring women that wear a size 26-28 are my favorite. They feature real women wearing their latest collections. Up now on their site is their Fall 26-28 Lookbook. The beautiful woman in the pictures is Emmicia and I am loving the outfits she is rocking. There is not one look I do not like on her. She looks polished, fun, and ready for the season. I think I need to add that plaid sweater coat to my collection, and those pom pom heels- yes and yes. Eloquii when are those going to be on the site...I need those ASAP! Eloquii you have done it again!!! I tip my hat and my wallet to you!